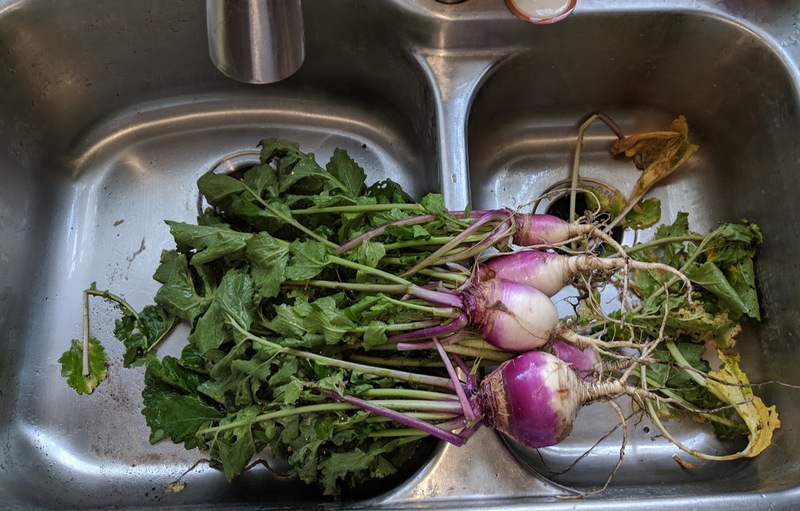 Turnips (and other goodies from my winter garden). I am loving my winter garden. It is the only advantage of living where there is no real winter. 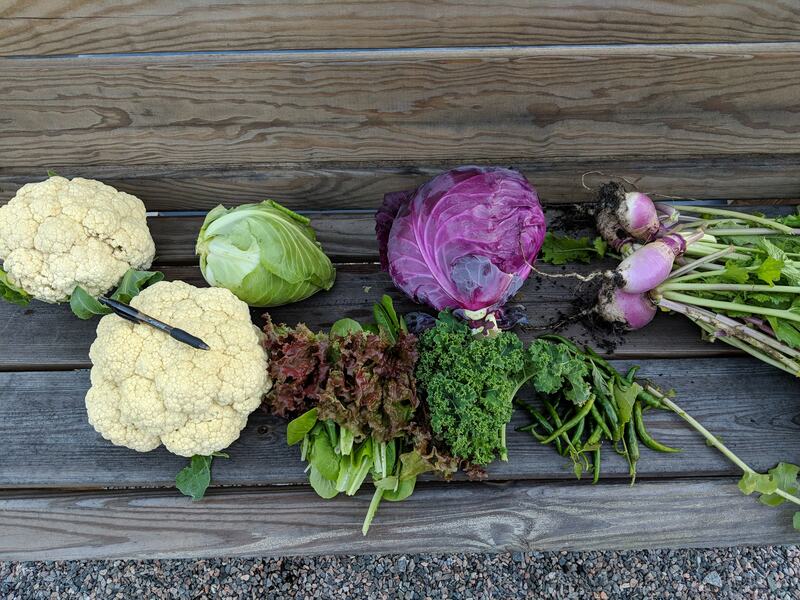 In the fall, I planted cabbage (red and green), cauliflower, brussel sprouts, kale, swiss chard, mustard greens, three kinds of lettuce, beets, onions, rutabaga, and turnips. The brussel spouts didn’t do very well, and only a few of the beets came up, but everything else has been wonderful. I’ve enjoyed roasted root vegetables (turnips, beets and rutabaga), lots of cauliflower dishes, salads, various dishes with mustard and swiss chard, and my favorite, turnips. I have grown even fonder of turnips. I eat them raw. I will grate them and sauté with just a pinch of sugar, or prepare them like mash potatoes. Turnips are also my favorite greens. After washing the greens to get any dirt off, I will boil them in a large pot of water with some ham or bacon added for an hour or so. Then, about 30 minutes before eating, I will add some of the turnip root that I’ve peeled and diced to the greens, bringing it back to a boil and cooking until the root is soft. I’ll dip out and drain off the greens and root, place it on a plate and drizzle the greens with some hot vinegar (vinegar infused with chili peppers). That’s good eating! We had turnips from our garden as part of our roasted vegetable mix tonight! For now, I can only dream of a winter garden as I prepare to go shovel the driveway for the umpteenth time this year. Your vegetables look great. We are still in the midst of winter here, but I did see the beginnings of some crocus poking through the ground today. Looks like a healthy, delicious assortment. At least, a healthy wine. I enjoyed reading about your winter garden, Sage. Green leafy vegetables have always been scary things to me, but I am trying to eat some. I did try cook and eat Swiss chard for the first time about 10 days ago. I didn’t die ~ LOL. I’m not sure if I’ll tackle turnip greens in this lifetime, even if you recommend them as your favorite and provide a cooking method. Wishing you lots more enjoyment from your winter garden! This sounds both delicious and healthy! I’m not a huge fan of turnips, but I’m glad you’re enjoying your crop of them! I am envious! I can’t wait for spring and the return of Beth’s Farm up the street fr5om me! It’s so cool that you can have a winter garden! Everything here is under a ton of snow for most of the winter. that sounds like a very productive garden! Your vegetables look fantastic … enjoy.